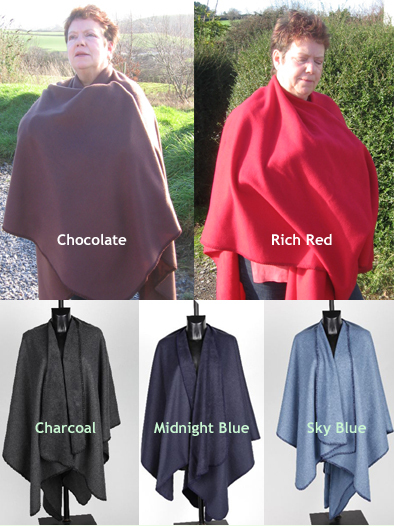 A beautifully soft, luxurious, opulent feeling, warm fleece wrap-around Ruana or Cape – a versatile garment, flattering to all. Made in Great Britain. Shaped with a cut out to fit around the neck and then wrap around (click dimensions below), so quick and easy to "throw" on, these Ruanas look good whether arriving at the ball, doing a spot of shopping, going to the races, walking the dog or simply enjoying your garden (but certainly not for scrubbing the kitchen floor!). Fleece Ruanas can be machine washed.